M. Night Shyamalan’s Glass is a film that’s been 20 years the making. 2000’s Unbreakable was always meant to be the first of a new trilogy but as time went on it appeared as if it was never going to happen. Then, all of a sudden, in 2017 a little film called Split upended everything and threw us back into the world of Unbreakable without us realizing it until the end of that film. So, here we are now with Glass, a film we all knew would crystallize the now dubbed Eastrail 177 Trilogy. And after all this time, how did Shyamalan fare with rounding out this interesting and different comic book universe? Well, it’s not The Last Airbender or Lady in the Water bad. However, it’s not Unbreakable or even Split good either. Glass opens with David Dunn (Bruce Willis) two decades after the events of Unbreakable, who now owns a home security store and is continuing to use his supernatural abilities to render justice. He tracks down Kevin Wendell Crumb (James McAvoy) who has four teenage girls locked up in an abandoned warehouse. The two clash but are caught by the police and psychologist Dr. Ellie Staple (Sarah Paulson). Dr. Staple takes Dunn and Crumb to a nearby facility to test and help them understand that maybe their “abilities” are just a mental state instead of being supernatural. We also learn at this facility is Elijah Price, aka Mister Glass, who is being tested for the same ailments. As things play out, because it is M. Night Shyamalan after all, there are many twist and turns that cloud what is true and what isn’t. Fundamentally speaking, Glass has something compelling to offer in terms of comic book mythology, the origins of it, how Dunn, Price and Crumb found their identities through each other and why their presence has been muted in a broader sense regarding the outside community. Perhaps their so-called identities are nothing more than self-delusion. Shyamalan questions, and suggests, that everything he established in Unbreakable and Split is nothing more than facade – that these films are actually psychological thrillers wearing the mask and cape of superhero movies. This idea is complimented beautifully in the film by a juxtaposition of Dr. Staple deconstructing the tropes of superhero movies and comic books, with that of Casey Cook, Joseph Dunn and Mrs Price, who are eagerly seeking the origins of comic books to reaffirm the identities of Dunn, Price and Crumb. On paper, Shyamalan incisively orchestrated some fascinating ideas with intricate layers that tap into why we believe in heroes and villains. 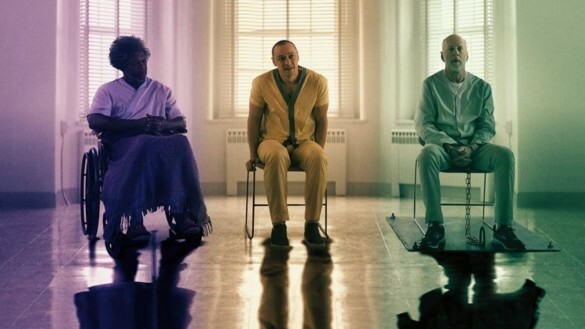 However, Glass unfortunately gets bogged down in overtly precise plot mechanics and not trusting the audience to keep up that it falters in the narrative progression and thematic clarity. There’s just too much going on and the film isn’t able to balance all of its ideas and storylines properly. As a result, the film becomes a clunky mess that isn’t quite able to fully realize the arcs of its protagonists or its interesting thematic undercurrent. Additionally, the characters of Dunn and Price are thinly utilized, amplifying those faults. After that great opening, Dunn is nothing more than pawn that is used a surrogate for the film’s action sequences. It’s unfortunate as Bruce Willis gives a great performance when deployed effectively, but sadly those moments are far and few in between. Price, in all his glory, doesn’t really come into the fold until the third act. So, like Dunn, his presence is dramatically stifled despite having a heavy presence in Glass‘ major thematic ideas. Crumb is the only character, other than Dr. Staple, who carries both dramatic and emotional weight in the film. He’s heavily involved narratively and James McAvoy gives another striking performance as he seamlessly transitions from one persona to the next. It’s easy to laugh off this off at the end of 2019 when we start talking about the best performances of the year, and I’m not suggesting it will be, but he should at least be talked about more often. He’s that good and by the end he conjures a pathos that’s genuine and sincere. Glass is a film that’s hard to grade. Or even recommend. If you’re into comic book lore and looking for ambitious ideas that explore the foundations of what make comics interesting, then it’s an easy recommendation. However, if you’re just hoping for a good movie to take your date to, then it’s rolling the dice a little bit. There’s no denying that Glass has editing and balancing issues. It’s the most problematic of this trilogy. But it also might be the most provocative to talk about and unpack. It’s neither a complete failure or an utter success. Maybe that’s what’s most appropriate, though, as our main protagonist were broken people looking for something deeper. Whatever the case is, these are the kinds of passionate experiments that we need more of in cinemas. Overall Grade: B-, I think?